In a move almost worthy of an April Fools’ maneuver, Waffle Press announced its acquisition of its officially-sanctioned counterpart, Raffles Press. In a smugly-worded email to Raffles Press’ Head of Monitoring Waffle Press, Waffle Press announced that it will have 95% ownership of Raffles Press with effect from Monday. The tabby cat outside Manna will retain its 5% share in Raffles Press. It will continue to strictly moderate the website by allowing the publication of all articles, except serious ones. It became apparent by the end of last year that Waffle Press had contacted Raffles Press directly with this proposal, and a massive sum of money, definitely not as a bribe. It is not clear where the money came from, though it is suspected to be from large advertising revenue from high traffic to the Waffle Press website, supplemented with coins harvested from canteen drains. The money was accompanied by a hastily scribbled letter on Economics Cafe foolscap, which detailed how Waffle Press writers were disappointed by this newspaper’s “wimpy attempt at an April Fool’s joke” and generously promised to “give [Raffles Press] a skooling [sic]”. They then outlined a plan for a merger/acquisition in a short letter, although this was not taken seriously at the time. The ramifications of the acquisition will be widespread. An anonymous J2 who ‘roughly knows’ the bulk of the H2 Economics syllabus noted, ‘A merger of the two organizations would combine the product-differentiating wit of the Waffle with the scale of the incumbent … something … sorry man I think I failed CT1s.’ When Raffles Press called the Economics Department, a teacher said he was too busy choosing demotivational statistics for the CT1 debrief to respond to our queries. Additionally, the fate of Raffles Press’ existing columns could be in limbo. Dear Aunt Agony would be so laden with sarcasm that it would be useless, potentially resulting in the opening of a second Underground. Inter-House Competitions coverage would be limited to mourning the death of the free T-shirt. Waffle Press commented that this would not be the end of its series of corporate acquisitions. 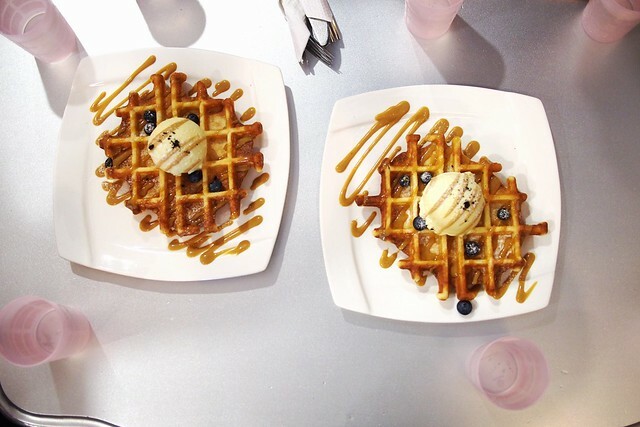 It plans for the school itself to officially be renamed Waffles Institution. Additionally, it intends to have the Waffle Press logo printed on the paper bags in which Chill waffles are packaged. The cost of the printing will be offset by the selling of confiscated phones and wifi permits. Current members of Raffles Press voiced concern about the acquisition, citing fears of publishing content ‘totally devoid of facts, and in turn, truth’. They were silenced with a bulk order of Chill waffles. However, it is with much disappointment that due to an excess of manpower, satire writers Abdul Qayyum (17A01B), Bill Puah (17S06B), and Yeo Jun Wei (17S03B) will be sacked from Press as of Monday. We are sorry you have to find out this way. Our club email is flooded with Waffle Press memos, memes, and videos of outraged meowing. Despite the flood of pleas and objections, Waffle Press has assured the public that no animals, plants nor humans will be physically hurt in this acquisition. Where is the waffle press of our generation?